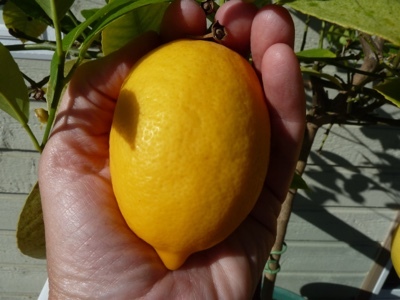 This lovely Meyer Lemon is still on the tree and as you can see...it is the size of my hand. There is something so satisfying about growing citrus trees. I admit, they are a bit tricky, but well worth the effort. They remind me of orchid growing. Once you know what you are doing...it's easy.